Hamstring pulls occur often from over-kicking and over-punting in football. Coach Brent explains how to prevent, recognize & heal a hamstring strain. When I was a freshman in college I came into summer training camp with high hopes of beating out the then senior kicker who had the starting job. I was not drinking nearly enough water during the hot summer practices in August. I was kicking a lot and working out a ton in the gym trying to do whatever I could to garner the job. Well, one day I went overboard. I was so focused on showing the coaches my ability and trying to prove my worth that I could earn the starting kicker position. I kicked 60 plus field goals and several kickoffs trying to ‘win the job’. Needless to say, it was way too much (see other articles where we mention a good protocol of how much you should kick) and I wound up straining my hamstring. I, of course, had to go to the trainer and figure out my next plan and how to rehab back to full strength. The prognosis was rather simple “Brent, you are dehydrated and you kicked way too much! … Let’s get some fluids in you and I want you to rest for 5 days with no kicking AT ALL and no leg workouts AT ALL” (Trainer John). No more kicking for you! As most of you can probably relate, I didn’t know how I would go 5 days without kicking and still earn the starting job as a freshman. It was a real tough 5 days of ‘waiting’ but I managed and sure enough after the rest period, my hamstring strain, also known as a pull, healed up! I was back on the field and a couple days later I earned the starting job and at the end of the season, I earned 1’st Team All-American honors as a freshman kicker! So what’s the moral of the story? Don’t over-kick, drink plenty of water, especially in the summer/hot seasons, and listen to your trainers! What do I do if I pull my hamstring? If you too experience a hamstring pull from over kicking (and sometimes more commonly from Punting) you should rest without kicking or punting, ice and give it time to heal. Typically 4-6 consecutive days of no kicking, punting or any leg exercises in the gym should revive you back to normal. If you still experience pain after a week of rest, you should definitely go see a doctor to get it evaluated and see what is wrong and how to fix! 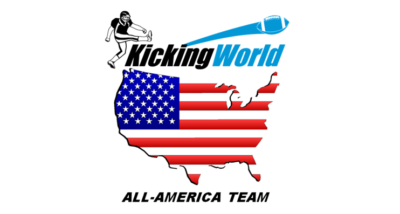 Stay tuned for the #3 Most Common Kicking Injury and how to prevent, recognize & heal it!